One of the most effective applications of 3D printing in the industrial world has been injection moulding, where the use of printed moulds has helped reduce materials cost, streamline workflows, and maintain consistent quality. However, it’s not the only manufacturing technology where 3D printing offers opportunities for new improvements and enhancements. As part of an ongoing drive to streamline and improve their production processes, forward-thinking foundries are combining 3D printing with sand casting. Sand casting is the process of casting molten metal using sand-based moulds. To begin with, the sand is contained within a frame (referred to as a ‘flask’ by professionals), after which the cavities for the mould, and the gates through which the metal will be poured, are imprinted using patterns. The two halves of the mould are placed together, and the casting takes place. Once the metal has cooled, it is simply a question of breaking away the sand and conducting any cleaning and/or post-processing the finished part needs. The sand itself is a specialist material, referred to as ‘green sand’, which combines silica, chromite or zircon with water, clay and anthracite. The name refers to the fact that it is used in its green — i.e. wet — stage rather than being set prior to casting. A wide range of alloys can also be utilised to great effect. Where does 3D printing comes in? 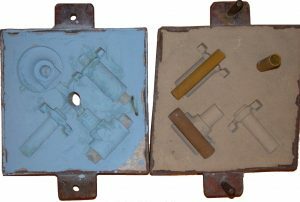 As with injection moulding, the patterns used in sand casting are quite expensive and time-consuming to produce (particularly if CNC machining is employed), and have a limited shelf-life. 3D printing eliminates these difficulties, allowing patterns and gating systems to be designed using CAD software, then printed as and when they are needed, at a significantly reduced cost. This has allowed foundries to begin deploying sand casting on a larger scale for production parts. In addition to eliminating the need to store parts, 3D printing allows for a level of detail and complexity that would be highly difficult to achieve otherwise. To further improve on this, patterns and gates printed in thermoplastic can be coated during post-processing, to improve their resistance to heat and sand abrasion and enhance the overall accuracy of the finished parts. Furthermore, 3D printing’s flexibility as a tool for rapid prototyping is readily apparent with sand casting applications. Typically, the time and cost involved in pattern making has limited the number of iterations a sand-casted part can go through during the prototyping stage. Once 3D printing has minimised the stress and expense involved in pattern making, foundries can take a far more agile approach to prototyping, testing multiple iterations of a part and ensuring any errors can be rectified before production begins. In terms of printing technologies, FDM and polyjet printing have proven highly effective for sand casting projects, as companies like Stratasys have demonstrated. A number of printers have also entered the market that have been specifically designed for sand casting applications, such as Ex-One’s S-Max. These machines are designed to operate in the rapid temperature changes that take place in foundries, with no detrimental effect on the quality or functionality of the parts they deliver. We would argue that there are lessons to be learned from the foundries that have successfully incorporated 3D printing into their workflows that any manufacturer could benefit from. Sand casting and 3D printing are truly complementary technologies, in that when they are utilised together, their respective advantages are enhanced, and their limitations overcome. Based on what has already been achieved, 3D printing looks very much set to become an indispensable part of foundries’ tool kits.